In the briefing room of Speed Vegas, a sense of anticipation (mixed with nervous tension) fills the air. Rob, the professional driver addressing our 20-strong group, is filling us in on the one-and-a-half-mile racing track we are about to attempt in a selection of the world’s best supercars: Lamborghinis, Ferraris, Porsches and Mercedes. Outside it is touching 39C and a heat haze ripples above the mountainous surrounding terrain. Speed Vegas opened on a stretch of land next to Interstate 15 earlier this year, but we are the first to try the experience using its state-of-the-art new clubhouse, with its equipment room, café and panoramic viewing terrace. 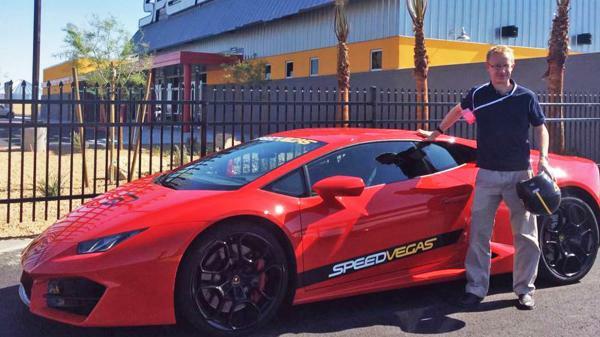 The attraction was set up by Aaron Fessler, an entrepreneur who had previously run a supercar hire company in Las Vegas but realised that customers were frustrated that they could not go full throttle on the streets without ending up in the local jail (and/or hospital). So he found a 100-acre plot of land, far away from hotels so as not to annoy anyone with noise, and built his own racetrack, with a fleet of about 20 cars. After listening to Rob’s advice not to “slam brakes at the apex” (which could cause a spin) and to focus on what’s 100 or 200 feet away so we’re always prepared for awkward turns, we venture forth to pick our rides. This is a glorious moment — a bit like heading out into a rental lot, only it’s unlike any Hertz or Avis you’ve visited. Before us is a gleaming collection of canary yellow Ferrari 458 Italias, electric blue Audi R8s, tangerine orange Porsche 911 GT3s and mustard-coloured Ford Shelby GT500s. “Which one do you like?” asks Roger Greene, the professional driver who will be in the passenger seat during my three laps (a seat that, very sensibly, has its own brake pedal). “Some of these cars can do 200mph, but if you hit that, you’re not going to stop,” he explains. We zoom along, negotiating No Man’s Land and turning into the straight. “Put your foot down — and don’t take it off!” says Roger. This is the high point, literally. The track has an elevation of almost 65ft and halfway through the straight it feels as though we might lift off. At the end of this section there is a tight corner, and we are doing 130mph. “Brake!” yells Roger. I do — and so does he. It’s as though we’re performing an emergency stop to avoid a cat that has strolled out in front of us; seatbelts jam into our chests. I complete my three laps, hitting 138mph at one point. Then we park and Roger takes the driving seat to show how it’s really done, masterfully completing two circuits and touching more than 140mph in our marvellous Lambo. “Actually, I like speed,” he says at one point. Actually, I can tell. 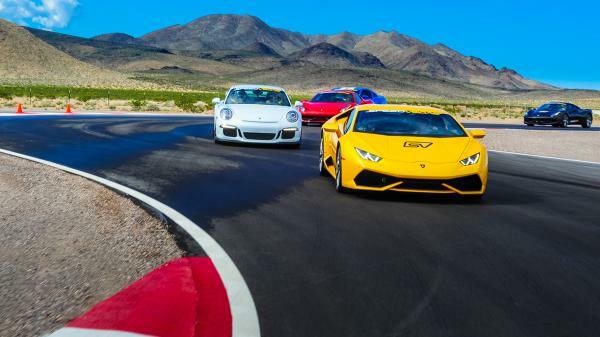 Vegas may be known for its hedonistic nightlife and high-rolling casinos, but it’s the new fast rollers in the desert that are its biggest, latest attraction (the cast of Jason Bourne, including Tommy Lee Jones, recently stopped by for a spin round the track). Afterwards, from the viewing terrace, we watch a blur of green, yellow and red monsters roar past — it’s better than sitting at any roulette table. Tear round the same tarmac as Formula One legends on a track day at Silverstone, the home of the British Grand Prix. Hop into a purring classic red Ferrari and, with a four-litre V8 engine and 400bhp (and a professional driving instructor), you’ll be speeding down the main straight at well over 100mph. The Circuit de Spa-Francorchamps is a test for even the most skilled drivers. Take a track day and get a feel for its hair-raising twists and turns (the most challenging of which is the Eau Rouge corner, where you’ll really feel the G-force). Choose between BMWs, Lotuses, Porsches or a McLaren. Expect breathtaking views and serious revs on this supercar holiday, starting in Zurich. The 340km driving day takes in the “big three” passes of the Swiss Alps — Susten Pass, Grimsel Pass and Furka Pass — before returning along the shores of Lake Lucerne. There’s a choice of Ferraris, Porsches or an Aston Martin. Details A two-night stay at the four-star Sheraton Zurich costs from €1,670 (£1,432) for two, including a day’s driving (00 41 43 542 0867, ultimatedrives.net). Available June to September. Fancy a weekend cruising around the Malvern Hills in a classic British Morgan? If you stay at the stunning Colwall Park hotel, the car will be yours from Friday lunchtime until Monday morning, leaving plenty of time to explore the nearby Cotswolds, head over the border to Wales or drive the black-and-white village trail in Herefordshire.